Minitaur, Analog Synth Rack/Sound Module from Moog Music. 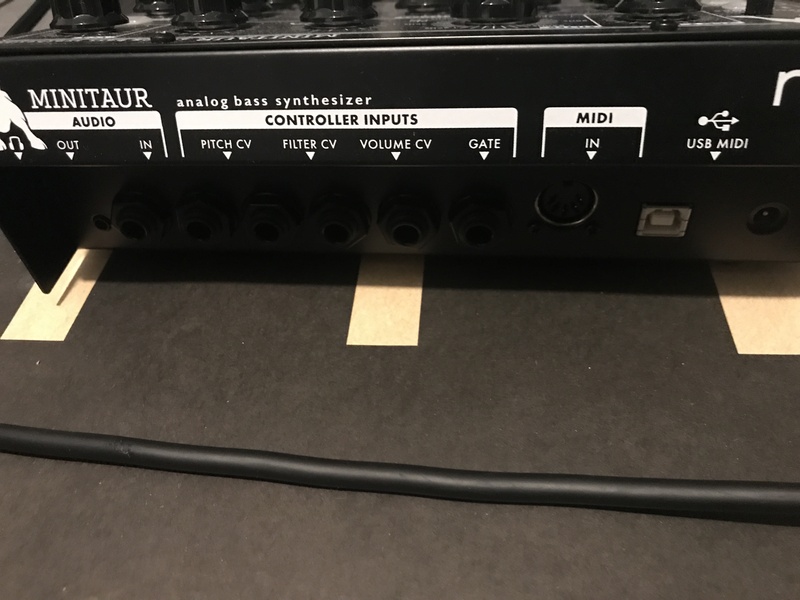 azzo's review (This content has been automatically translated from French)" MOOG BASS"
Analog synthesizer Monophonic Bass Expander type. It is limited to 6 octaves of notes 0 72. Two Oscillators sawtooth or square oscillator 2 is adjustable to plus or minus 1 octave. Another rglage allows agreement with another instrument on the two oscillators plus or minus one semitone. Moog ladder filter in the rsonance is self-oscillating if completely open. A Triangle type LFO to modulate the filter and oscillators frquence. And Glide (switchable) are the parameters provided on the housing. In addition to that between the CV for the Pitch, Filter, Volume and Gate on the rear face. A MIDI DIN connector type in a USB port for configuration from a computer, from audio, audio output, an output and a headphone between food, complte the rear face. Still in Beta, the editor allows in addition to the configuration of the front pushes a configuration with Minitaur midi to realize most Parameter a resolution of 14bit. yes only with a MOOG CP251 NASA diploma becomes useful !!! The edition of sound effects or is it easy? Is the manual clear and sufficient? The sounds they agree your style of music? Buy for bass! and he made good the gringo! Are the effects effective and ADAPTS? I like the bass and MOOG Minitaur of quality is that of MOOG! rather twice that if he adds a POWER button !!! Aryhauger's review (This content has been automatically translated from French)" A must"
What I, like the least? nothing! 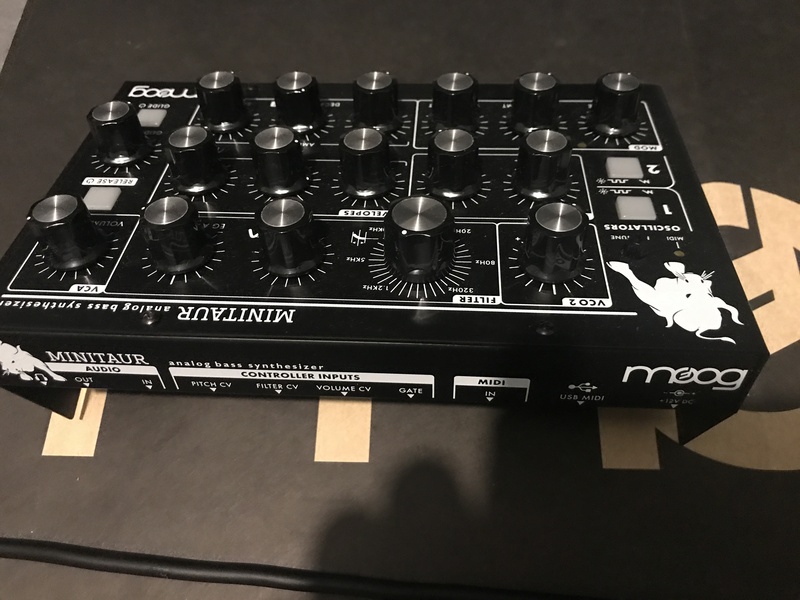 Maxidingue's review (This content has been automatically translated from French)" Maouss Costo"
I pass over the MOPHO and Evolver (for analog) I do not like. Kori G's review (This content has been automatically translated from French)" Pleasantly surprised ...."
Well I will not dwell on the machine as it is easy to watch videos on youtube. Just say that the first edge is rather well built, quite heavy for its size and therefore a sign of strength. Plugs jacks are good quality plastic anything, to see the length .. The knobs are nice and beefy look. Nothing more simple even if the book is to download and not in French. Editing software on mac / pc can be downloaded from the website after registration moog but I can not dwell on the subject, using no computer for music. I use midi with an MPC2000XL, an ORB or other sequencers and almost exclusively for bass or percussion sound (very interesting thanks to the speed of the filter, lfo) and therefore noon (of Moreover this is the only negative point in my opinion of Minitaur, no out noon). 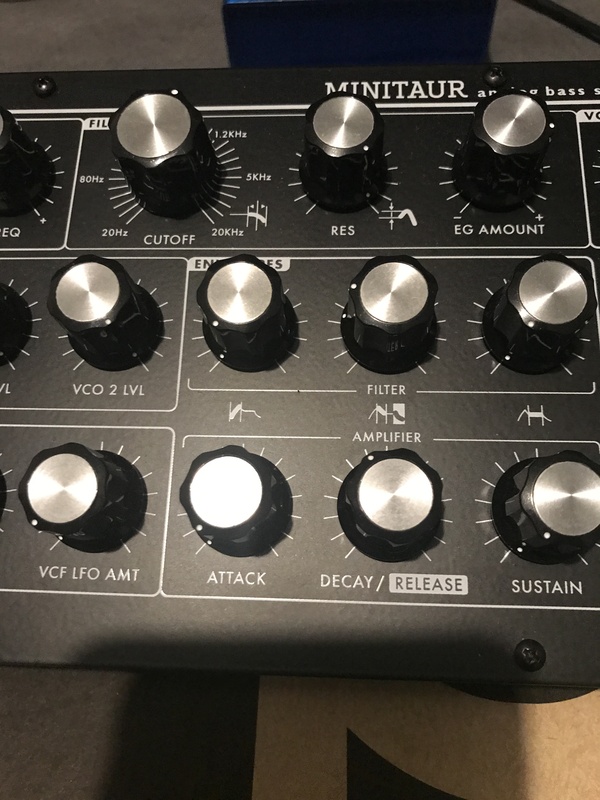 The sound is obviously not equivalent to a true Taurus nor his old moog known but it has a good grain especially for low or both synthetic percussion sounds, but also leave some aggressive leads and properly modulated. I personally think it sounds a little better as the slimPhatty, although fewer opportunities. I recently started using and so can not yet speak, including its presence in the mix compared to my old machine. 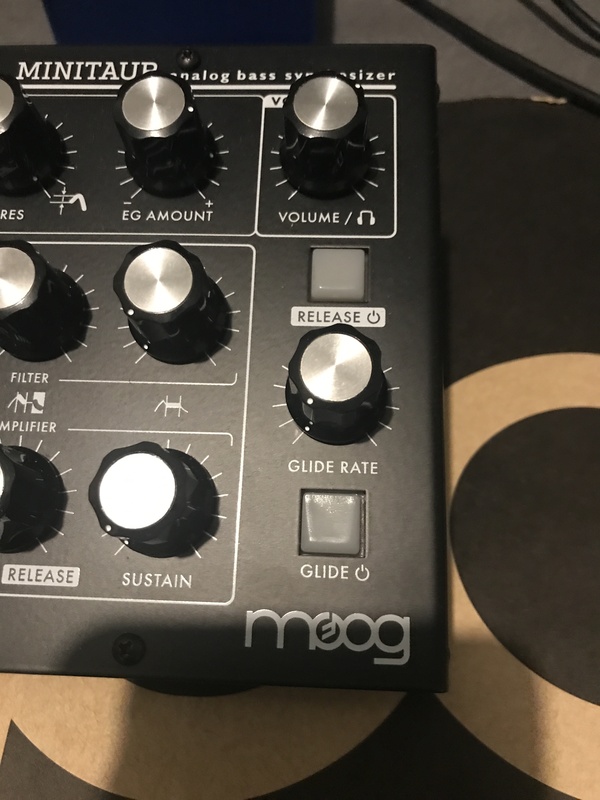 But for now I would say that the price and the recent moog, it is rather a small mono-synth interesting and I am pleasantly surprised by its noise footprint compared to other products such as recent moog voyagers, subphatty or the last, that I appreciate very much and I probably will not buy it. I have very good machines with big sound rich in harmonics, machines certainly old, fragile and bulky but that is not always required to effects such as reverb, chorus or other that it sounds in a mix. The Minitaur him to need a little boost in output to gain harmonics but this is only myself and my tastes dinosaur. And I think his use of Ordi with Live example is really nice if you are not allergic to vst / vsti like me. Moog added to its accessory range a wooden custom kit for its Minitaur synthesizer.